Langhorne-Middletown Fire Company - Times Publishing Newspapers, Inc.
It’s been a busy month for volunteers at the Langhorne-Middletown Fire Company! 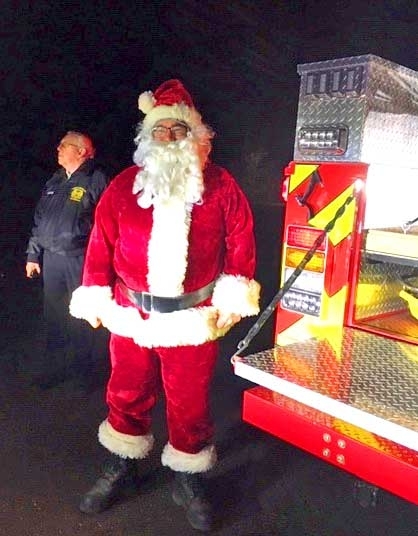 Santa made his rounds, escorted by our firefighters and contributing members, to various tree-lighting ceremonies, open houses, and atop the fire trucks on Christmas Eve. Sesame Place fireworks rounded out the year, as our firefighters stood watch and reinforced the perimeter in case fire suppression was necessary. In 2018, their volunteers responded to 685 fire calls, and participated in over 70 community events such as parades, sporting events, car washes, graduation ceremonies, fire prevention education and tours, Girl Scout and Boy Scout functions, Community Day, and the Langhorne Business Association’s Harvest Day. All of these events would not be possible without the dedicated, hard-working men and women who volunteer their time to keep the fire company up and running. The Langhorne-Middletown Fire Company is seeking locally talented individuals to fill vital positions within the volunteer fire company. They welcome retirees, recent grads, new families to the area, and anyone who has an interest in giving back to the community through volunteering. There is a critical need for Firefighters, Fire Police, and individuals with experience in public relations, human resources, graphic design, accounting, fundraising, information technology, and photography. With support from the community, the Langhorne-Middletown Fire Company will continue to provide fire suppression to protect and serve our residents. Filling non-firefighting positions within the company allows our active firefighters to concentrate on training and preparation for responding to emergencies. All training and equipment for firefighters and fire police is provided free of charge, by the company. In-house training, also called drill, is an opportunity for their own officers and members to fine-tune skills using our apparatus and equipment. Drill is held every Thursday evening. Thank you, in advance, for your continued support of this volunteer fire company. Please follow them on Instagram, Facebook, or check out the company website for more information about upcoming events. PHOTO CAP: Santa, escorted by Fire Police volunteer Larry Harvey, gets ready to make his rounds through Langhorne!